The idea of motorcycles and glass sculptures together in an art gallery may seem like an odd combination, but for the third year the Sarjeant Gallery will be displaying three classic motorcycles over the Christmas period. The display is to coincide with the annual Cemetery Circuit that takes place on Boxing Day and is a racing event that has been staged in Whanganui since 1951. Over the last two years we were lucky enough to work with local engineer Steve Roberts, a world renowned motorcycle enthusiast and designer, putting together a selection of motorbikes for display. This introduced us to a new world of enthusiasts that were more than happy to share their passion projects with us. This year we reached out to the classic bike club and three names were put forward, showcasing three bikes and their owners. Bill James’ 1954 AJS 7R Factory Racer, Andrew Kidd’s 500cc 1963 Norton Manx and Willie Williamson’s well known 1955 Triumph Tiger. All three bikes have raced in the Cemetery Circuit and throughout New Zealand on the classic bike circuit. Willie and his team mate Julie Loveridge have also raced at the Isle of Man where Julie was the first New Zealand woman to ever do so. Whanganui is well known as the home of the Cemetery Circuit which ran for the first time on the day after Boxing Day in 1951. 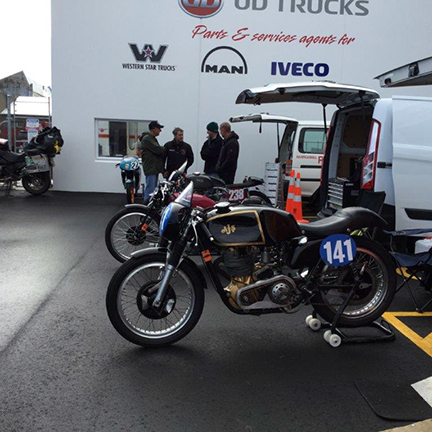 The Organisers had a vision of staging “Continental Round-the-Houses” style motorcycle racing on the city Streets of Whanganui. An influential mover and shaker in the planning group was Percy Coleman, a prominent Whanganui businessman with a track record of successful international motorcycle racing including, in 1930, being the first New Zealander selected to represent his country at the Isle of Man TT races. The first decade was dominated by Whanganui’s Rod Coleman, New Zealand’s first Isle of Man TT winner in 1954 and a feature race winner in five of those first ten years. 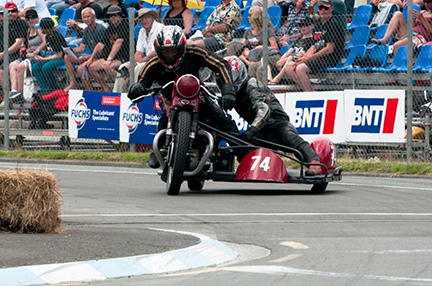 The Circuit is the 3rd round of the 2017 Suzuki Series which has races in Taupo and at Manfield in Fielding, with over 300 enthusiasts racing, it attracts more than 10,000 spectators every year. The response from both locals and visitors to the gallery has ranged from surprise to excitement. Having these bikes in the gallery, encourages people that have never visited the gallery to come and see what else the Sarjeant has on offer. In 1998 the Guggenheim Museum in New York mounted the exhibition The Art of the Motorcycle which featured 114 motorcycles selected for their historic importance. The exhibition received record visitor numbers. We do get some questioning looks from some of the more classical art lovers, but we see this as an opportunity to show a different aspect of design and craftsmanship. These wonderful machines have been lovingly restored by their owners and although they are meticulously designed with a huge attention to detail, they are intended to be used rather than just seen as display pieces. Putting them in the context of a gallery encourages us to see them in a different light. The opportunity to talk to the owners is when you see their true passion for the bikes and their love for the sport come out. On Saturday the 30th of December at 5pm there will be a talk from two of the bikes owners and one previous owner.